Natural color enhancing 1mm semi-floating pellets. 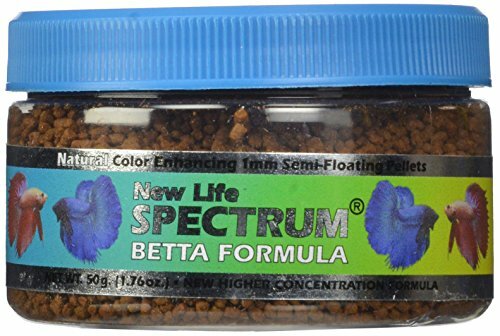 New life spectrum food is made with high-quality, easily digestible south Antarctic krill, herring, squid and new Zealand mussel protein and several all-natural color-enhancing ingredients for a balanced diet that boosts immune system function and enhances the full spectrum of your fish's color. With the belief that all fish require a complete and fully balanced varied diet, new life also contains algae meal, that consists of seaweed, kelp and Haematococcus pluvialis (a micro algae), a premium grade of natural Spirulina, as well as a fruit and vegetable extract that consists of spinach, red and amp; green cabbage, peas, broccoli, red pepper, zucchini, tomato, kiwi, apricot, pear, mango, apple, papaya and peach. Also contains a generous inclusion of garlic for its anti-parasitic and immune boosting properties. With no added hormones. Made in the USA. If you have any questions about this product by New Life Spectrum, contact us by completing and submitting the form below. If you are looking for a specif part number, please include it with your message. Omega One Super Color Cichlid Pellet - Large Sinking 20oz.